Lou Simon began writing at an early age and originally wanted to be a novelist. Unfortunately there is not a high demand for novelist, so she turned to law and became an attorney after graduating from NYU Law School. She never gave up on writing though and studied creative writing at the University of Florida. Not having enough time to write novels, she began writing screenplays. Knowing the challenges of getting a screenplay read and produced, she decided the best way to get her screenplay made was to do it herself. Utilizing her attorney business background and connections she was able to get funding and made her first film The Awakened. The experience and satisfaction of making her own film motivated her to make more. In the last several years Simon’s determination resulted in four films she wrote, produced, and directed. One of her recent films soon to be released is All Girls Weekend starring Jamie Bernadette. Childhood friends try to rekindle friendship by spending a weekend in the mountains full of adventures. Deciding at the last minute to go for a short hike in the surrounding forest, the five women get lost. Alone and hungry, through the freezing cold, they must battle the elements, each other, and an unforeseen force that seems determined to stop them from leaving. In recent years you have aggressively produced, wrote, and/or directed four feature films. Can you tell us about your filmmaking the last couple years? I have been incredibly luck y to have been able to find the funding to make a film every year since then. That is the biggest obstacle to indie producers, but I am blessed to have the support to continue working. Part of it is that I’ve become very knowledgeable about the business side of filmmaking so that I’ve earned the trust of those people who are willing to invest in my films. 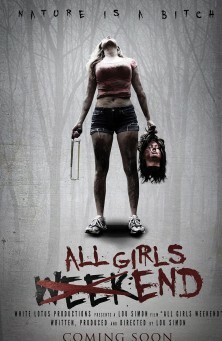 All Girls Weekend is one of your upcoming horror and adventure films. 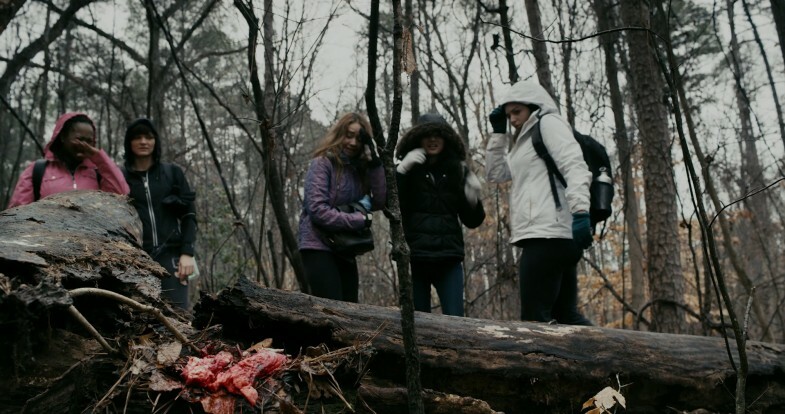 You wanted more than a girls in the woods horror, can you tell us what makes this film unique and what audiences can expect? LOU: I can’t say much without giving away the twist of the story. It is completely different than anything I’ve seen. There’s no monster or killer in the woods. It’s a survival story. I call it a horrific adventure, because it is about surviving in the wilderness with a supernatural twist. Above all, I wanted to send out a message about respecting our planet Earth and how the scariest thing facing humanity is the awesome power of Mother Nature. It will kill us all if we don’t change our ways. All Girls Weekend has a small cast, can you tell us about the cast and casting process? LOU: It’s an all-female cast, a homage to one of my favorite horror films “The Descent.” Keeping the cast small, mostly 5 women, allowed us to keep the budget small, because unlike Neil Marshall, I didn’t have 5 million dollars to make a movie. We put out a casting call through IMDb and got submissions from all over. We tried to cast as much as possible from the Southeast, because we needed flexibility from the actors. 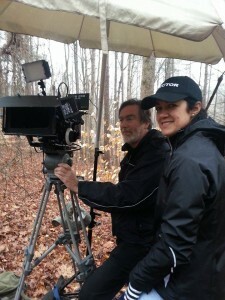 We were filming primarily outdoors and had no way of knowing far advance what the weather conditions would be like. The only person to come from L.A. was Jamie Bernadette, who nailed the audition from the get-go. Other than that, Katie Carpenter was a mere 4 hour drive to Atlanta from North Carolina, and the other 3 actors (Gema Calero, Karishma Lakhani, and Sharron Calvin) lived in the Atlanta area. With the film completed, what’s next for it? LOU: We are submitting to film festivals this week, and we already have the film with a sales agent that is seeking distribution internationally. Currently you have a new film in development and another one soon to be released, can you share the status of them and anything else you’re working on? LOU: “Fear the Reaper” is a project that is slated for 2016. We are working on packaging it now with some named stars. The process when it’s a higher budget film is much longer than say “All Girls Weekend” that we produced in 6 months. “Agoraphobia” starring Tony Todd and Cassandra Scerbo, is set to be released in North America in a couple of months. That should go a long way in helping me package “Fear the Reaper” as well. I’m also planning to film the pilot for a TV show this fall. So, yeah, there’s no rest in my near future. To keep updated on All Girls Weekend follow the Facebook and Twitter pages and official website. For additional information on Lou and all her films, check out the White Lotus Movies website and her IMDB.